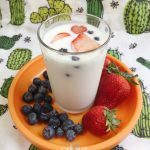 Learn how to make organic homemade kefir probiotic drink - a recipe that has been used for centuries by nations famous for their longevity and health. 1 tbsp kefir grains See our notes where to buy kefir grains. Place kefir grains in a glass jar. Add milk and mix well with a wooden spoon. Cover jar with a paper towel or napkin and secure it with a rubber band (so it can 'breathe'). Check in 24 hours - kefir is ready when it thickens to the consistency of buttermilk or non-strained yogurt (if it doesn't thicken, mix it well with a wooden spoon & give it some more time). When kefir is ready, strain it through a plastic strainer and reserve the grains for a new batch. Store stained kefir in a refrigerator and use as desired for breakfast smoothies or as a powerful probiotic to improve health gut bacteria. If you haven't tried kefir before, purchase it at the grocery store (preferably, plain) and give it a try. Then you would know how it supposed to taste when it is fully fermented. It is possible to use powdered kefir starter culture to make kefir but it will only last you a few batches and will eventually stop culturing. Kefir grains, on the contrary, will allow you to make a homemade probiotic drink in perpetuity. It is possible to store kefir grains in milk in the refrigerator for a few days or even weeks (without damaging your grains) if you need to take a break from making kefir for a while. Cold temperatures slow down the process of fermentation. When you are ready to restart, just rinse the grains with milk, make a new batch following the recipe to revive the grains, stain it, discard the liquid while saving the grains. Then continue with the recipe, as usual. Strained milk kefir can be stored in the refrigerator for a week (or even longer period, according to Cultures for Health) but it is best to consume it in the next 2-3 days to get the full benefits of rich probiotic cultures.